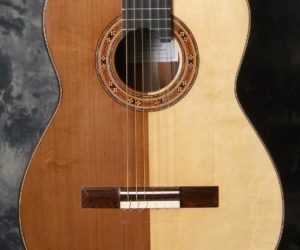 Here’s an excellent Hauser style classical guitar from the workshop of Gerald Farrell in Hamilton, Ontario. 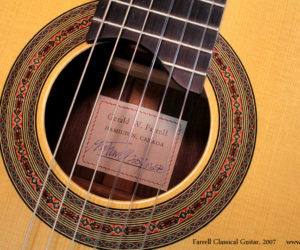 Jerry Farrell has been building guitars since 1972. 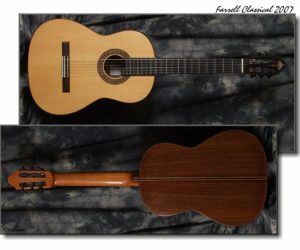 This beautiful Hauser style Farrell classical is in great overall shape with only one minor repair on the top and some minor play wear on the finish. The elevated fretboard allows easier access to the upper frets and the tone is full and clear with lots of projection and overtone complexity! !